How to buy your books and souvenirs? Can I have a discount ? We have a souvenir area in Study/ Discussion Room, you can buy them there or order by telphone. You can get 10% off for buying $1,000, and 15% off for buying $2000. My friend lives in a foreign country , do you have international postal service? Yes, but we have to charge an extra fee for international postal service. Why some of the selling books are old? This kind of books are second-hand books, we also have brand new ones. You can ask for the guide for detail information. I love a souvenir that I once bought from The Lin Yutang House, but it is no longer selling. Is there any chance to but it again? We are sorry that we no longer sell and produce the sounevirs that you want anymore. However, we will have many other new types of souvenirs. Thank you! The Lin Yutang House does not sell the books of Dr. Lin which I saw on the Internet , can the museum buy the books for me? Sorry, we only sell books that we already have from The Lin Yutang House. If you need a large number of the books, we can help you order them. On where is The Lin Yutang House located? What is the address? How to get to the House? ※Compact cars are not allowed to enter Yangde Blvd. from 7:00 to 15:00 during holidays, visitors could take other routes to the mountain from Beitou or Tianmu. How is it charged visiting the House? Is there any discount ticket or group ticket? The ticket price is NT$30 per person. Group tickets are available for groups with more than 4 people, NT$25 per person. For children aged 6 and under, elderly aged 65 and above, disabled people with one companion, resident of Yong-Fu Vil., and those who hold a volunteering service ID of Taipei City, no price will be charged. Which route should drivers take to get to the House? Is there any parking space? Drive along the Yangde Blvd. to Yangming Mt., you can see the House on the left at Yong-Fu Vil. Compact cars are not allowed to enter Yangde Blvd. from 7:00 to 15:00 during holidays, visitors could take other routes from Beitou, Tianmu to the mountain. Cars can be parked along the white lines on Yangde Blvd. At what time is the House open? When is it closed? Exhibition room is open from 09:00 to 17:00, Tuesday to Sunday. The restaurant is open from 10:00 to 21:00, Tuesday to Sunday. The House is closed every Monday. The closed time during Chinese New Year will be adjusted according to announcements posted by the DGPA(Directorate-General of Personnel Administration). How to get to the House by taking public transportation? The Lin YuTang House is located at Shihlin District. Visitors could take the MRT to either Shihlin or Jiantan station, then transfer to the bus(260, 303, R5, s15, s16, s17), and get to Yong-Fu(The Lin YuTang House) stop. Besides the guided tour, do you have personal voice navigation devices for use ? Sorry, we don' t have personal voice navigation device. However, our guide will be glad to introduce The Lin Yutang House to you in person without extra fee. Is individual guide tour application available? Yes, individuals are applicable for requesting for the guide tour. How do groups request for the guide tour? 1.limit number of people? 2.leader's or tour guide's ticket? reservation needed? how? Groups of visitors could communicate in advance with the House to request for the guide tour. One leader/tour guide of the group would not be charged the ticket price. How to contact you if there is any suggestion or question about The Lin Yutang House? If you have any question or suggestion, you can fill out the questionnaire and hand it to the guide at the information desk. Is the House open at Chinese New Year's Eve and New Year's Day? No, the House will be closed during Chinese New Year. Please check the webpage for detailed information. Does ticket place or the restaurant accept credit cards? No, there's no such service for now. Are visitors allowed to take photos? Yes, to protect historic relics and other visitors, please do not use flaslights and tripods. Can guide dogs get into the exhibition rooms? Can pets be brought in? Guide dogs are allowed to get into the exhibition rooms, but there's no much space in the exhibition rooms, so the entering of guide dogs should be thought over. How to apply for joining the volunteer in Lin YuTang House? Please contact with the guides at the information desk. How to become a friend of the House? We welcome you to leave your email and other information from "join us" on the upper right of our website, the House will inform you of our latest activity information. We also have VIP cards, 200 each, featuring one-year free visiting, 10% discount for buying souvenirs and lecture activities. Re-enter into the House after walking out? Re-entering into the House is applicable the day visitors buy the ticket. The ticket is valid only at the buying day. How to qualify for a free visit? 1. children aged 6 and under; elderly aged 65 and above. 2. people with volunteer ID of Taipei City. 3. disabled people and one companion. 4. people with VIP card of the Lin YuTang House. Those mentioned above are free to visit the House. How to learn about the exhibition information? Information concerning the exhibition in the House is available on the webpage. We will also regularly give away activitiy information, and we welcome visitors to take it. Are all the exhibitions free in the House? Each of the exhibitions would be free after buying tickets. Will the works be explained? We provide a free guide tour after tickets purchased. Which kinds of exhibition will the House hold? Can food or drinks be brought into the House? Drinking, eating and chewing gum are prohibited in the exhibition rooms. How to rent the indoor space? Is reservation required? Exhibition rooms are for visiting, they are not for rent. Reading/Discussion room is available for meetings. NT$500 per hour. NT$1000 per 3 hrs. for educational institutions. Reservation is required, please call: (02)2861-3003. Limits of time to borrow the indoor space? Reading/Discussion room renting is limited to 3 hrs. at one time. Another application is required if more time is needed to use the space. We provide drinking water and media equipment, please maintain the environment to help keep the space clean. The application should precede the scheduled time for 2 weeks. Does applying in person or ID card needed to rent the indoor space? Either applying in person at The Lin Yutang House or applying by telephone would be valid. No ID card is needed. Do government institutions and schools have a discount on rental? No, but long-term cooperation can be considered. Is restaurant reservation charged additionally? Can it cancel out the orders?Capacity? Please contact the "Yo Bu Wei" restaurant for restaurant reservation. Tel:2861-3003#11. Indoor capacity for the restaurant is 40 people, and there is an outdoor balcony with seats. Are tickets required dinning in the restaurant and renting the space? Tickets are still required, they can be used to cancel out the dining charge. Is not opening to the public possible if the activity dates are at days which the House is closed when renting the space? Yes, please apply 3 months in advance for the sake of our announcing. Is wedding photographing or amateur photographing allowed in the House? Application/Charge? Except for the exhibition rooms, everywhere in the House can be used to take wedding and amateur pictures, application in advance is required. wedding photographing and commercial photographing will be charged NT$1,000 per hour. Is ads or catalogs photographing charged? How to apply for commercial photography? charging standard? Please contact with our staff, the charging would be NT$1,000 per hour. Is the placement of the exhibition changeable when filming or videotaping? No change for placement of the exhibition is allowed to make. Please do not use flashlights and tripods while videotaping in the exhibition rooms. What exhibition space does the House have? Exhibition room, Reading/Discussion room, restaurant(indoor). How to apply for an exhibition in the House? Are fees charged? Please contact the staff in the House for special exhibition project service. Content of the exhibition in the House? Dr. Lin YuTang's historic relics and invention works. Are data and books available to be borrowed? If there is any need for academic research, please contact with the staff. What data and books and info do the House have? 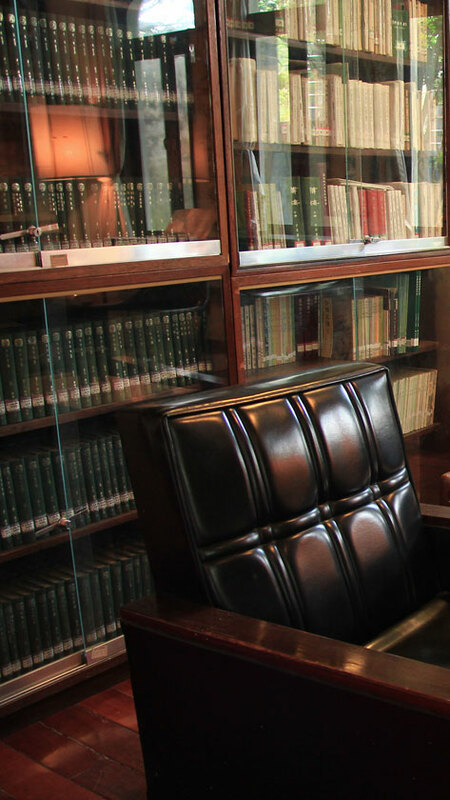 There are 12 types in total, including Dr. Lin's books, Dr. Lin's works, manuscripts, family members' works, papers and books for research, documents, letters and edited info(manuscripts included), media info, historic relics, clothes, furnitures, calligraphy and paintings, and letter index. How to apply for borrowing the books in the House? Please contact with our staff, and apply 1 month in advance. Important or Seriously damaged books and papers cannot be applied. Applying for books and papers in the dry cabinet requires research plan and official document from the research organization. The Lin YuTang House has the right to judge whether to approve the application. Does the House provide space for scholars and master's/doctor's degree students to do long-term research? The space here is limited, we cannot provide space for long-term research, 1 week is the limit if needed. Please apply 2 months in advance. Can the House help apply for the academic research from Immigration Office for long-term Chinese scholars staying in Taiwan? We do not provide such service. Applicants must possess a Bachelor's degree or above, with research goal and subject. After the application is approved by the House, the applicants shall begin their research.